Our Nationally acclaimed Pre-School Program is a detailed curriculum that focuses on improving preschool age children’s (3 , 4 and young 5 year olds) basic motor and listening skills. These skills will help them enter society with a more confident and enthusiastic outlook. They will become better students at school, better listeners and more ambitious towards the future. We believe that the time between ages of 3 and 5 are the most important years of a child’s development. Our program will enhance positive development in a fun and motivating way. 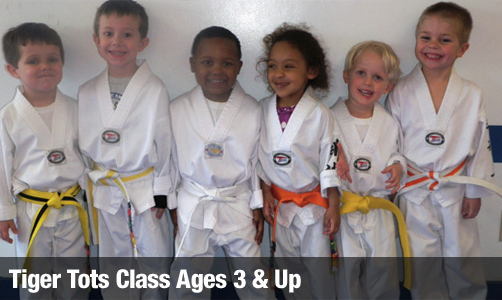 The Tiger Tots program will prepare your child for our Children’s Taekwondo program. Tiger Tots enter the Children’s Taekwondo with balance, coordination basic techniques and focus which enables them to succeed and advance at an accelerated pace. In the Tiger Tots classes, your child will be exposed to positive social interaction. They will learn how to work with others and follow directions from their instructors. Our Tiger Tots instructors are good role models who are trained specifically to work with preschool-aged children. This skill will help your child’s aim, listening skills and reaction skills. They will excel faster in any physical activities. Your child will also become a better listener and more focused student in school. Teamwork is necessary for any young child to develop. The more confident your child is willing to work with others, the more he or she will accomplish. Your child will develop character, which will help him or her make new friends and become a better leader in life. Having control means making good decisions. Whether your child is handling a pet or handling a problem, he or she will to learn to make the right decisions. Control builds confidence. This skill is crucial to develop at an early age. Your child is beginning to participate in many physical activities that are challenging like riding a two-wheel bicycle. Your child will develop good balance and a better posture. Developing a good memory is exercise for your child’s brain. The sooner your child exercises, the smarter he or she will become. Our drills are constantly helping your child think and make smart decisions. Our instructors use drills to help create the vision that discipline is fun and rewarding. Your child will take pride in doing the right thing. Your child will also follow directions better. It is important for children to understand the importance of being healthy and physically fit. If your child does not burn off excess energy exercising how will he or she burn off all of that energy. Your child will learn left from right. They will become better physical participants is sports and activities. The better coordination your child has, the fewer injuries your child will sustain.In our Tiger Tots classes, we make learning fun and educational. Our goal is to help your preschooler be the best they can at everything they put their minds to.